The Dialogue ER automatically calls your contacts till person reached. A prerecorded message alerts that emergency exists. Preprogram up to six (6) contacts. 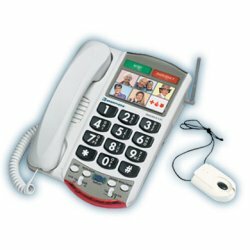 Wireless remote allows you to call for help from up to 80 feet away. Once answered, have two-way communication or one way for listener. Remote control is lightweight, can be worn as a pendant or on a belt. It can also call your contacts automatically if no activity within a preselected period of time. Easy to program. Speakerphone. Powerful amplifier increases handset sounds up to 24 dB. 6 Photo speed dialing buttons. Bright ring flasher and loud ringer. Has a battery back up in case of power outage.